Why Don’t Christians Look More Joyful? Don’t you think Christians should be the most joyful people on the planet? Why don’t the redeemed look more like the Redeemer? The Hebrew word for joy is an interesting word. It comes from the Hebrew word “simchah” and can mean “joy, gladness, pleasure,” as in having “the joy of God,” but another Hebrew word is used for a totally different joy, and it’s the Hebrew word “sasown” and means “gladness, exultation,” and “rejoicing.” That’s a lot stronger than just having pleasure. The ancient Israelites had their moments when even they were joyful (“sasown”) before God, and rejoiced and exalted the Lord for all He had done. In the New Testament, we find that the Greek word translated into joy is “chara,” and means “gladness, joy,” or having “an occasion for joy.” The joy the Apostle Paul writes about is actually part of the fruit of the Spirit (Gal 5:22). Jesus was about to go to the cross and then return to the Father, but the disciples felt a little bit like orphans, and so Jesus told them, “Truly, truly, I say to you, you will weep and lament, but the world will rejoice. You will be sorrowful, but your sorrow will turn into joy” (John 16:2), and it is the same Greek word. They will be crushed, thinking Jesus’ death ended all their hopes, but their sorrow will turn to joy when they see the risen Christ (and they did!). Biblical joy is the joy of the Lord. The joy in knowing He is coming again for us. The joy that is coming in the kingdom when all sorrow will end (Rom 21:4). In fact, the more you read the Bible, the more you should be filled with joy! When you think of joy, think of “Jesus, the founder and perfecter of our faith, who for the joy that was set before him endured the cross, despising the shame, and is seated at the right hand of the throne of God” (Heb 12:2). I think all Christians should be the most joyful people on the planet, but why aren’t we? The Book of Nehemiah says, “the joy of the Lord is your strength” (Neh 8:10c). The joy of the Lord can carry you through the sorrows of the world, because it gives you the strength to endure. We can rejoice at the joy that’s ahead of us just like Jesus did. When the walls of Jerusalem were restored, the people celebrated, “And they offered great sacrifices that day and rejoiced, for God had made them rejoice with great joy; the women and children also rejoiced. And the joy of Jerusalem was heard far away” (Neh 12:43). That means joy should be heard, not just felt, so “May we shout for joy over your salvation, and in the name of our God set up our banners! May the Lord fulfill all your petitions” (Psalm 20:5)! In fact, “Be glad in the Lord, and rejoice, O righteous, and shout for joy, all you upright in heart” (Psalm 32:11)! We rejoice, exalt the name of God, and look toward the kingdom with joy, while doing what we’re commanded to do (Matt 25:34-30; 28:18-20). Joy comes from the Lord and joy comes from knowing the Lord. 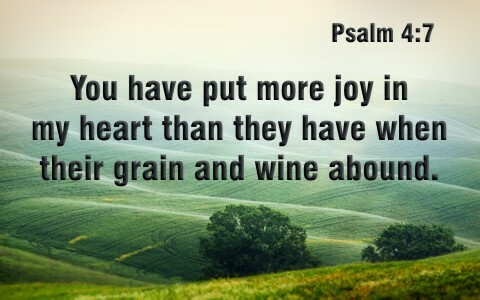 The psalmist writes, “You have put more joy in my heart than they have when their grain and wine abound” (Psalm 4:7). Don’t have joy? Ask for it! Read God’s Word and see how it all ends (Rev 22). Thought ought to make you joyful, in fact, the most joyful person on the planet! Many believers have gotten so bogged down with the problems of like (me too!) that it’s zapped their joy and they’re running on fumes. I remember Jonathan Edwards, the powerful preacher in Colonial America, was once falsely accused and driven out of the church and from behind the pulpit, but Edwards never lost his joy. That’s because his joy was not based upon circumstances…it was based upon Christ. He was never in danger over losing his joy for something that happened (even if it was unjust, and it was). He didn’t allow circumstances to rob his joy because his joy didn’t depend on extenuating circumstances. One important fact is, if we are living in sin, we will not have the same joy Jesus spoke about. We can’t be a believer and live in sin and still be joyful. That’s because most believers who are living in sin are miserable. Our former worship leader used to literally shout when it came to the place where the songs said, “Shout unto the Lord.” Not really, really loud, but he was being biblical because he was shouting unto the Lord because he was full of joy and it was spilling out all over the sanctuary. That’s biblical joy. To him, it was his strength. It gave him strength to lead our music worship. It gave him strength to endure the death of his son. It gave him strength to witness to one of his co-workers. There is strength in joy. And it is contagious. When I read certain Bible passages, it makes me joyful. Such verses as, “I am the resurrection and the life. Whoever believes in me, though he die, yet shall he live, and everyone who lives and believes in me shall never die. Do you believe this” (John 11:25-26)? If someone you love dearly dies in faith, the funeral is so much more joyful than those who don’t know Christ. We have hope in this world, but it’s not hope in the world. Our hope is nothing less than Jesus Christ. That is the anchor of our hope and the glory that’s coming for everyone who has trusted in Christ. Did you know that smiling is contagious? You might not make everyone you meet smile, but it’s going to have a more positive effect than if you frowned. The same thing goes for joy. If you are living with joy, then you are leaking out joy, and others can “catch it.” Don’t let that joy be doused with the troubles of this life. Be like Jonathan Edwards, who would not allow anything to rob his joy. It didn’t matter to him if he was innocent of the accusations. What God had done for him through Christ made everything else pale in comparison, and like the Apostle Paul, he could say, “For I consider that the sufferings of this present time are not worth comparing with the glory that is to be revealed to us” (Rom 8:18). If you replaced the word “glory” with joy, I think that’d still be true. Previous post: Why Do Some Christians Seem So Judgmental?